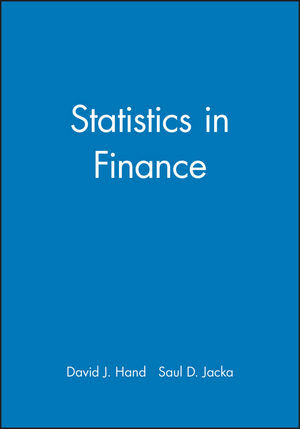 The chapters in this book describe various aspects of the application of statistical methods in finance. It will interest and attract statisticians to this area, illustrate some of the many ways that statistical tools are used in financial applications, and give some indication of problems which are still outstanding. The statisticians will be stimulated to learn more about the kinds of models and techniques outlined in the book - both the domain of finance and the science of statistics will benefit from increased awareness by statisticians of the problems, models, and techniques applied in financial applications. For this reason, extensive references are given. The level of technical detail varies between the chapters. Some present broad non-technical overviews of an area, while others describe the mathematical niceties. This illustrates both the range of possibilities available in the area for statisticians, while simultaneously giving a flavour of the different kinds of mathematical and statistical skills required. Whether you favour data analysis or mathematical manipulation, if you are a statistician there are problems in finance which are appropriate to your skills. David John Hand OBE FBA is a British statistician. His research interests include multivariate statistics, classification methods, pattern recognition, the computational statistics and the foundations of statistics. Saul D. Jacka is the author of Statistics in Finance, published by Wiley. 1. Introduction (David J. Hand and Saul D. Jacka). 2. The Relationship Between Finance and Actuarial Science (Philip Booth and Paul King). 3. Actuarial Applications of Generalised Linear Models (Steven Haberman and Arthur E. Renshaw). 4. Consumer Credit and Statistics (David J. Hand). 5. Methodologies for Classifying Applicants for Credit (Lyn C. Thomas). 6. Credit Scoring and Quality Management (Kevin J. Leonard). 7. Consumer Credit and Business Cycles (Jonathan Crook). 8. Probability in France: an introduction (Saul D. Jacka). 9. Introduction to Financial Economics (Stewart D. Hodges). 10. American Options (Damien Lamberton). 11. Notes on Term Structure Models (Saul D. Jacka). 12. Default Risk (Dilip Madan). 13. Non-parametric Methods and Option Pricing (Eric Ghysels, Éric Renault, Olivier Torrès and Valentin Patilea). 14. Stochastic Volatility (David G. Hobson). 15. Market Time and Asset Price Movements: Theory and Estimation (Eric Ghysels, Christian Gouriéroux and Joanna Jasiak).